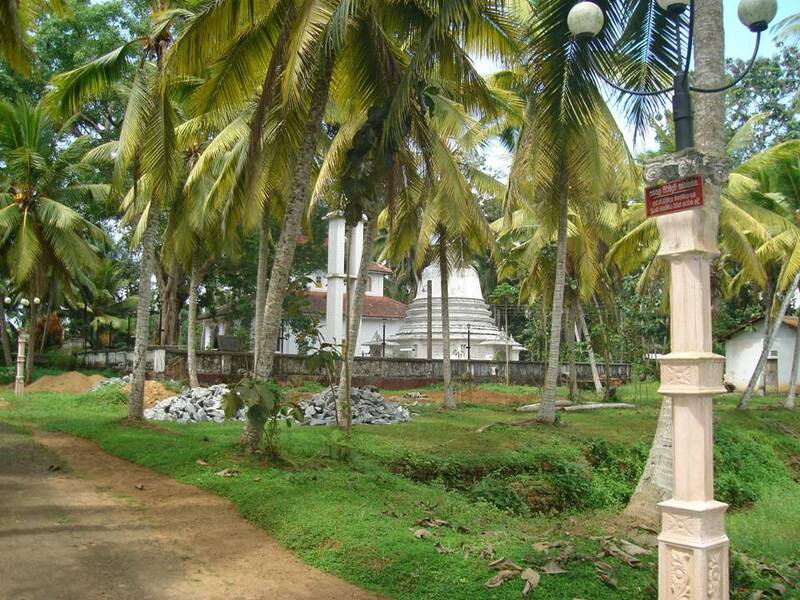 The temple now known as Sri Pushkararama Rajamaha Viharaya at Pathahawatte, Kothalawela is certainly an important piece of Raigampura Heritage – and not just for its religious significance. 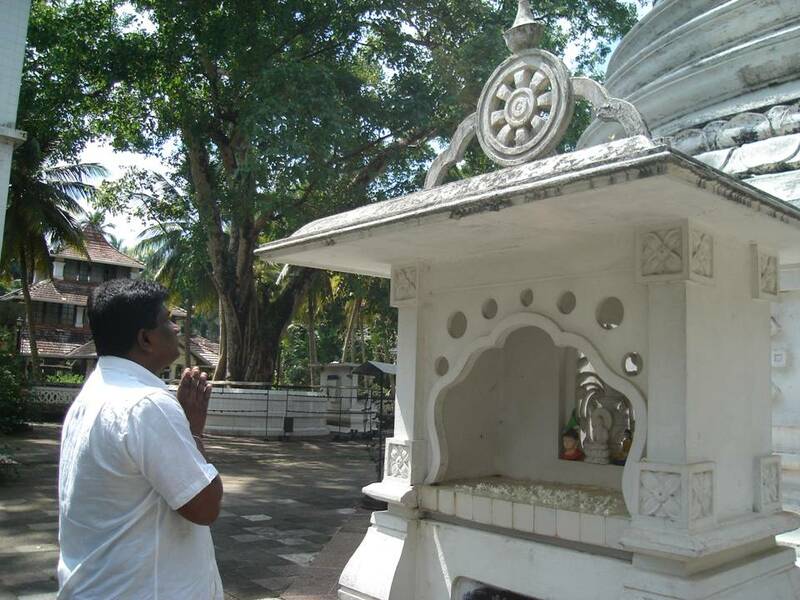 Reachable by taking the right turn at ‘Kotalawela junction’ – near the 11th kilometer post on Panadura-Horana Road, the entire land of the temple of 12 Hectares (5 acres), an archeological reserve since 1970, is surrounded by a huge wall of kabook. It is 2 meter wide and the height varies between 2 -3 meters. Given the depth of the foundation, the original height could have been easily twice of that. This wall dates back to either Kotte or Gampola period. No temple needs that level of protection. So this place could not have been a temple in its heyday. Mostly, it could have been the palace. But of which king? When it was built? There are two schools of thoughts. The common belief is it was the land that housed the palace built by Raigam Bandara or Pararajasinghe (brother of Buvanekabahu VII and Mayadunne) who ruled Raigampura from 1521-38 AD. Interestingly, both the present Loku hamuduruwo and Archeological Department endorse this opinion. Although that cannot be completely denied the available evidence does not back it fully. Firstly, by the time of Raigam Bandara, Bandaragama has largely lost its significance as its centre of Raigama. So there was no dire need to build a palace there. (In fact, Raigama again became an independent kingdom only in 1521 AD after the famous ‘Vijayaba Kollaya’. During the period of King Vijayabahu VI Raigama was part of the larger Kotte kingdom.) Secondly, for most of the turbulent period he reigned in Raigama, Raigam Bandara was fighting against elder brother Buvanekabahu, while joining hands with the youngest Mayadunne in Sitavaka, so it is difficult to think he planned building a large palace complex. 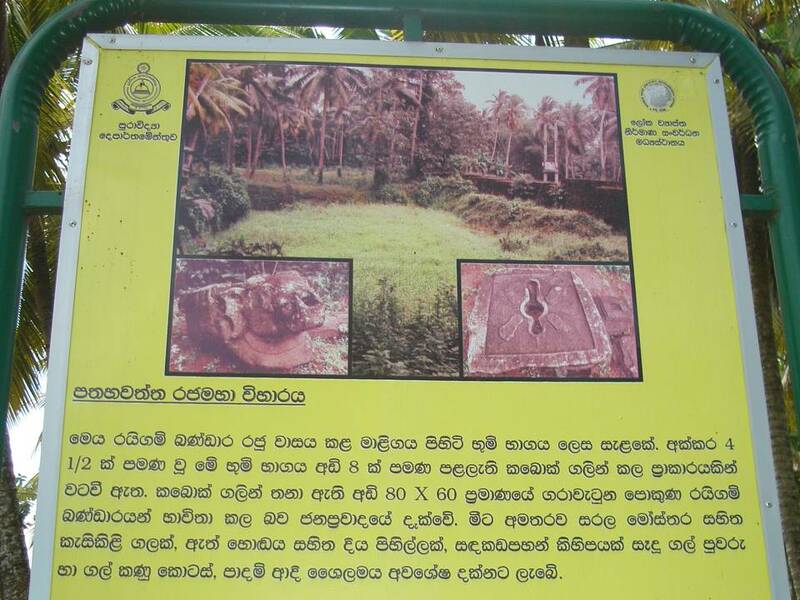 Thirdly, some literature claims Raigam Bandara stayed at a place at Mapitigama in Sitavaka during the battles with Kotte kingdom. He might not have stayed for the entire period, so we cannot completely rule out the possibility that present Pathahawatte was his kingdom. The other school that includes several prominent historians believe it had been the palace of Prabhuraja Nisshanka Alakeshvara (1360-87 AD)– perhaps the most illustrious ruler of Raigam kingdom. Nisshanka Alakeshvara was the one who built the castle at Kotte kingdom, surrounded by a huge wall not too different from the one we see today at Pathahawatte. So it is fair to attribute that too to him. Mayura Sandesha, believed to be written during the reign of Nisshanka Alakeshvara (which also includes an eulogy about him) mentions the peacock (=Mayura) spent one night at his palace. He (peacock) was instructed to worship Veedagama temple the first thing next day morning. (“Vandu Veedagama munida udasana”) So Veedagama temple could not be too far from the place. As of now Pathahawatte is less than one km from the Veedagama temple. This proves to some extent that the former could be Nisshanka Alakeshvara’s palace. Probably Raigam Bandara too have later stayed in the same place. Leaving the history aside for the moment it will be interesting to see what we find at this land today. 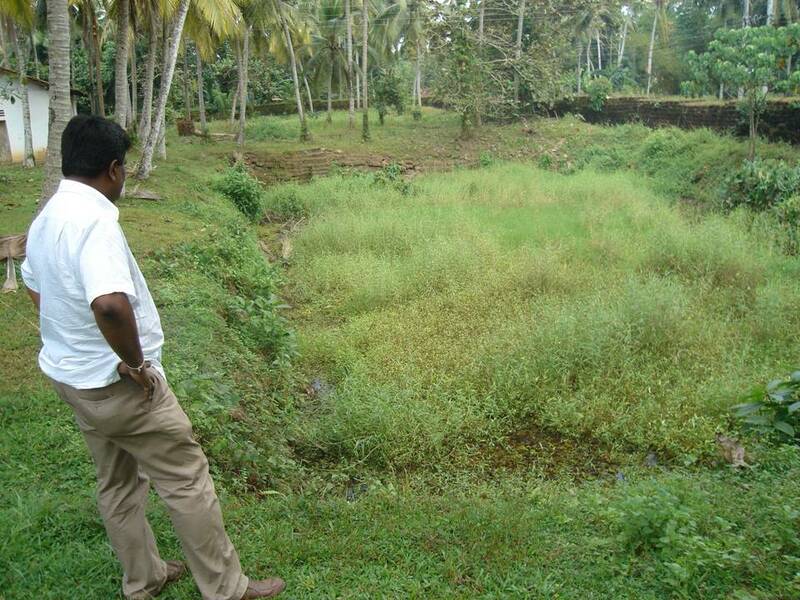 Most evident feature is a huge pit of 25 m x 15 m size – which could have been either a pond or most probably a swimming pool (=pathaha). It was well built surrounded by a stone wall. The linkage to the place name Pathahawatte is apparent, but it should have been established long before we think. Even Rajavaliya refers to Pathahawatte as the point where Mudliar Samarakoon arrived with his army to fight the rebel Edirille Rala during the Kotte period. No matter who built the palace and the surrounding kabook wall, it is reasonable to assume the existence of one or more moats. (=Diya Agala) This was common during those times. These were deep and either filled with water (mostly with crocodiles) or mud. Mayura Sandesha author while describing the Raigampura wall says the moat was built to fit the size of the former. So it should have been minimum 3 meters wide and 3 meters deep. However, today we do not see any evidence of such a moat. Difficult to assume that survived such a long period. No comprehensive excavations done at Patahawatte, so we have to be satisfied with the few archeological artifacts to be seen on ground. One was a part of a vessel made of stone that takes the shape of a head of an elephant. This might have been used to collect water coming from the roof of the palace. The other interesting one is the double toilet seat – which has two back to back seats. Who used it and how it was used (mostly not simultaneously) is not known. The common belief is that it was the common toilet seat of the king and queen. Existence of a temple in the ancient palace complex then was not known. It might have been possible that bricks and other material were taken away to build other structures during the Portuguese period and later. The current temple was build somewhere in the beginning of nineteenth century. Ajantha Mendis – another Murali in the making? His background is odd. We have heard soldiers making their mark in others fields of sports, but not in cricket. Even during the colonial times, when cricket was restricted to white sahibs, not many military men were seen in turf. Perhaps it has to do with the time one has to spend on practicing and playing. Compared to other games, cricket is a real time killer and to use Sir Arthur Clarke’s words it is the ‘slowest form of human activity’. The dynamism in military often does not go hand in hand with such a slow form of sports. 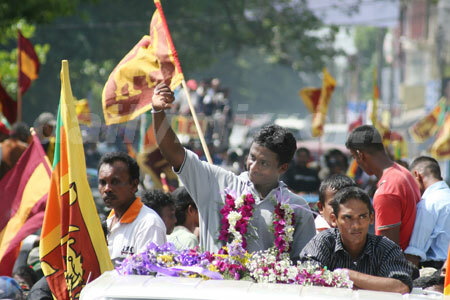 Ajantha Mendis, of course, is a trend setter, not a mere follower of traditions. He is surely a new generation cricketer – in every aspect. Players like him are the ones who so audaciously pronounce that cricket is no more a game to be played only by Colombo elite – or in the broader sense the white sahibs who invented it. A latest icon of Y generation, he shows the sign of becoming another Murali, filling a talent gap that existed for too long. Don’t think Aussies will be too happy. Balapuwaduge Ajantha Winslo Mendis (born March 11, 1985 in Moratuwa) is a cricketer who plays for the Sri Lankan national cricket team. Although classified as a right-arm, slow-medium bowler, Ajantha Mendis is a spinner who bowls a mixture of googlies, offbreaks, top-spinners, flippers and legbreaks. Batsmen have been confounded by the variety of deliveries he has up his sleeve and are at a loss to figure out what his stock delivery is. Mendis was a prolific wicket-taker for Sri Lanka Army in the 2007-08 season and had taken 46 wickets at an average of 10.56 and strike-rate of 31 from six matches. 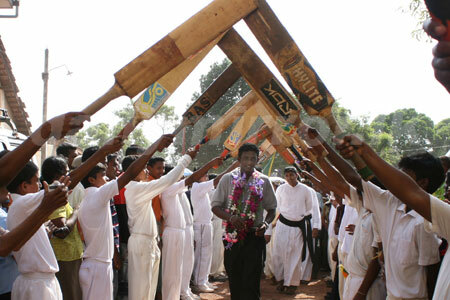 His performances did not go unnoticed for Mendis was called up to the Sri Lanka squad for the tour of West Indies in April 2008 After impressing on debut in the Caribbean, Mendis only grew in stature – in particular, because of his ‘flicker’, which he releases with an unusual snap of his fingers. In a short span of time since his debut, Mendis has flummoxed international batsmen and teams renowned for their ability to play spin bowling. His best bowling performance in a one-day international came in the final of the 2008 Asia Cup, where he took 6 wickets for 13 runs in just his eighth match. His 17 wickets in the tournament earned him the Man-of-the-Series award. A right arm spinner, he made his One-Day International debut against the West Indies at Port of Spain in 2008 and took 3 for 39. He also plays for the Kolkata Knight Riders in the Indian Premier League. Jerome Jayaratne, the Sri Lanka Cricket Academy coach, said: “Mendis is unusual, freaky and has developed a ball which could be described as a ‘flicker’, which he releases with a snap of his fingers, which is very unusual compared to other orthodox spin bowlers.” That ball is reminiscent of the former Australia spinner Johnny Gleeson, who had a similar delivery. Mendis is the author of a new delivery – the Carrom Ball. Since the Doosra, the Carrom Ball is the latest addition to the cricket lexicon. To bowl a “carrom ball” in cricket, the ball is held between the thumb, forefinger and the middle finger, and instead of a regular release, the ball is squeezed out/ flicked by the fingers like a Carrom player flicking the disc on a Carrom Board. It could result in an off-break, a leg-break, a googly or even a zooter. “I have just seen the future of spin bowling – and his name is Ajantha Mendis.” Rob Steen thinks Sri Lanka’s latest find is a keeper. A colourful half page advertisement in Daily News says it all. 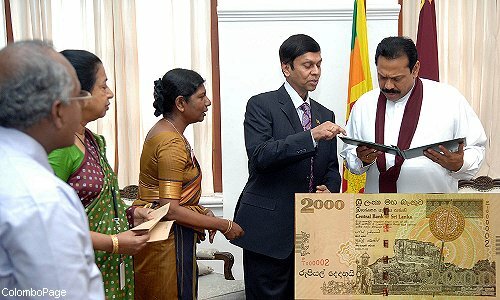 Central Bank plans a new currency museum at Anuradhapura. This adds to Central Bank’s innumerable current functions; researching oil drilling, conducting lectures for A/L students, micro-managing micro finance, insisting so called ‘good governance’ on others but not on itself, publishing books on Sri Lanka’s heritage and branding those question them ‘terrorist sympathisers’. Are these what a Central Bank supposed to do? How successful in Central Bank of Sri Lanka in these two functions? Dreadful. I would not even consider a C minus. One day we cannot wake up to find our banks not returning deposits due to a financial system collapse. That is why we pay to have Central Banks. They are supposed to guarantee that financial system is alive and kicking. They are supposed to supervise, catch and stop any culprits. 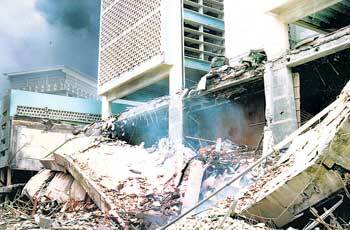 The banking system in Sri Lanka still stands on its feet not because of Central Bank. The private banks are cautious. The state banks need not be cautious because they are backed by treasury – thanks to tax payers. Had it not been for the treasury support one of the state banks would have taken the system down drains long ago – given the somersaults they do. Pramuka Case is adequate illustration for Central Bank’s ability to prevent a financial institution under its supervision taking enormous risks. Attempts to micromanage micro finance (with less than 1% aggregate capital within system) show their ‘expertise’ in financial systems. Ha Ha Ha Don’t make me laugh! As the sole currency issuing authority (Prabhakaran or Pillayan have not got the idea yet!) Central Bank of Sri Lanka is supposed to maintain the price of Sri Lanka Rupee against international currencies and also its own. It cannot control the rise of price of bread, but if everything costs more than what it was last week, surely there is something wrong with monetary policies. That was what Nobel laureate Milton Friedman said: Inflation is everywhere and always a monetary phenomenon. Right now Sri Lanka records the highest inflation rate in South Asia and within the top ten countries worldwide. (To be fair, we are still better than Zimbabwe) For the last year it was from 20 – 25%, and now nearly 30%. Markets prices of all goods and services, including essential services are of continuous rise. It has risen to such uncontrollable levels Central Bank of Sri Lanka even unsuccessfully changed the Colombo Consumer Price Index, to diverge the blame. 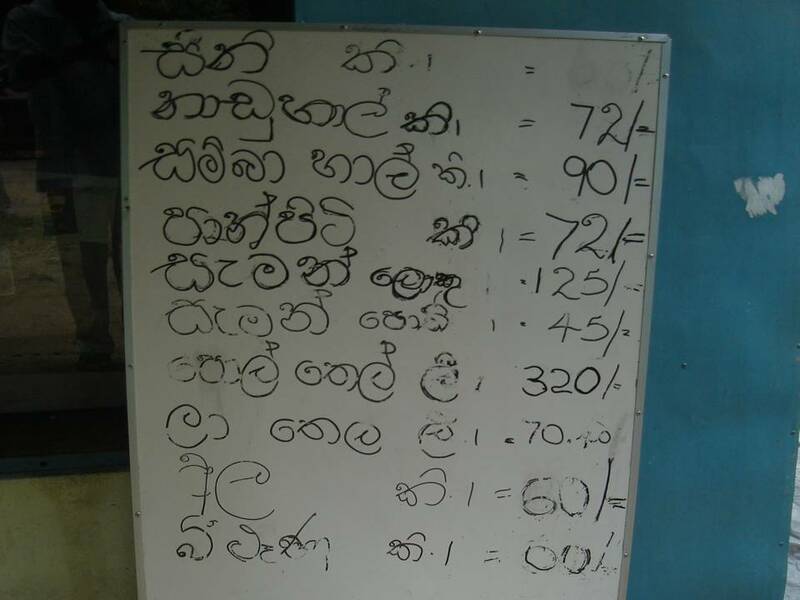 High prices spoiled even the annual Avurudu celebrations throughout the country. Every evidence points that Central Bank is not of control. It has failed to stop printing money (=increasing money supply) in bulk. It has failed to tighten monetary policy. The inflation is so bad the Minister for consumer affairs admits his inability to control prices. A hyperinflation situation is on the cards. This could lead to protests as happened in other countries under similar circumstances. Inflation is common symptom of a war. Any war needs money, in bulk and fast. The only solution most governments have is to print money in bulk. This brings down the value of money, as there is no increase in the supply of goods and services. The negative correlation between the war and economy is not readily understood by the politicians. That is why we need Central Banks. One key role of any Central Bank is to be government’s economic advisor. It is supposed to give independent opinion. We pay for that. Central Bank of Sri Lanka has an Economic Research Department of more than 100 researchers to do just that. Had a single researcher in Central Bank ever pointed out the cause of this inflation? Did they ever advise the government to stop this meaningless war and enter into talks with rebels? Perhaps it is useless blaming Central Bank as a whole. Its head is a political appointee whose only task seems to be justifying every stupid act of the government. It is unfortunate that Mr Ajith Nivad Cabraal, whose only qualification is an unsuccessful local government politician, sits in the same chair once held by eminent economists of the land. He is not an economist. His knowledge of economics, or rather lack of it, was amply demonstrated when he said he did not print any money and all currency notes in circulation were autographed by the previous governor. What can be expect from somebody who does not even know that in economics ‘money printing’ means an activity far more complex than mere physical print of money? In UK, the Governor of Bank of England was supposed to write to exchequer informing the remedies if inflation rate crosses mere 2%. If that cannot be brought under 2% within a period of six months the Governor has to submit his resignation. Mervin King now behaves as his pants are on fire. Fair enough. That was what he is being paid for. Unfortunately no such good governance is practices in this side of the Suez canal. The evident neglect of duties by head of Central Bank can only lead to a definite economic crisis. What plans government has to stop it? Does at least Mr Ajith Nivad Cabraal admit that it is his fault? Or will we have to continue blaming government for appointing this hapless individual for such a responsible post?